The first attempts at radio broadcasting in Czechoslovakia began after the First World War. The first radio programme, made up of words and music, was broadcast on the first anniversary of the establishment of independent Czechoslovakia on October 28th, 1919, from the telegraph station at Prague's Petrin lookout tower. Regular radio broadcasts began on May 18th 1923, from a military tent in Prague-Kbely, making Czechoslovakia the second European country after the UK to have regular radio broadcasting. The long-wave broadcasts at first lasted just one hour per day and consisted of a brief lead-in and a concert. The country's broadcasting pioneers were the journalist Milos Ctrnacty, the businessman Eduard Svoboda, and Ladislav Sourek, director of Radioslavia - the company that distributed radio receivers. These three men created a limited-liability company called Radiojournal, which was majority owned by Radioslavia. 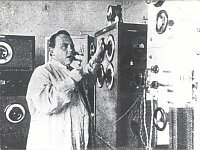 Radiojournal became Czechoslovakia's first radio operator after receiving permission from the Ministry of Post and Telegraphs. Milos Ctrnacty became its programme director, Alois Svoboda the technical director. The main source of revenue for Radiojournal were subscriptions - regular fees paid by owners of radio receivers. The first subscriber enlisted in September 1923. Radiojournal organised public listening session in Prague in order to promote radio broadcasting and attract new subscribers. In 1923 the company also started publishing a monthly called Radiojournal informing about radio broadcasting. January 1924 saw the first broadcasting intended for listeners abroad in English and Esperanto. In May the same year the Czech equivalent of the word "broadcasting" ("rozhlas") was coined and began to replace such expressions as "radiophony" and even the English expression "broadcasting". In december 1924, Radiojournal moved from the tent in Prague-Kbely into a building owned by the post office at Foch Street (today's Vinohradska Street) in the centre of Prague. In 1925, Radiojournal broadcast the first live transmission of a concert of the Czech Philharmonic, the first live transmission of a church service and the first live transmission of president T. G. Masaryk's speech. Many different nationalities lived in Czechoslovakia back then, so Radiojournal started broadcasting for the German, Hungarian and Ruthenian minorities. Revenues from the subscription fees failed to cover the costs and provide the necessary funds for further development. In 1925, the state gained a majority share in Radiojournal via the Ministry of Post and Telegraphs. The year 1926 saw the introduction of several novelties, such as the time signal and regular news bulletins that were produced by Czechoslovak Press Agency. The first radio drama appeared. New radio stations opened in Brno and Bratislava. In 1926, a Radiojournal orchestra was established and later developed into the Prague Radio Symphony Orchestra as we know it today. Another two stations - Ostrava and Kosice - started broadcasting in the late 1920's. The 1930's was a "golden era" for pre-war radio. The number of subscribers was growing constantly to reach one million in 1937. The programme included practically all genres, from educational programmes to sport reports, from classical music to cabaret. The station also offered short programmes in Esperanto, English and German intended for listeners abroad. Various technical inventions contributed to the development of radio broadcasting. One of them was a predecessor of today's tape recorder, blatnerphone, which recorded sound on a steel tape. At the end of 1933 the station was given a permanent headquarters at 12 Foch Street (today's Vinohradska Street) where it has remained to this day. In the 1930s some European countries (Great Britain, Germany, Russia) started broadcasting on short wave. With the war approaching they tried to win foreign listeners over for their political standpoints. Czechoslovakia, too, responded to that propaganda. On August 31, 1936, the Radiojournal company launched its short-wave broadcasts for audiences abroad. It broadcast in five languages four hours a day. By the end of the 1930s the volume of broadcasts increased several times. After the occupation of Czechoslovakia and the establishment of the Protectorate of Bohemia and Moravia in 1939, the radio was subject to the protectorate authorities and all employees of Jewish origin were forced to leave. The short-wave international service was limited to a two-hour broadcast in the Czech language. During the Second World War, programmes were broadcast to Bohemia from Moscow, Washington and London, which was the seat of the Czechoslovak exile government. Listening to those broadcasts in the Protectorate of Bohemia and Moravia was a crime punishable by severe sentences. On May 5, 1945, a call to arms broadcast on the radio started the Prague Uprising. The following battles in the surroundings of the radio building claimed many lives and the building itself was severely damaged. After the war, the international service broadcasting on short wave resumed. The news was not written by the Czechoslovak Press Agency like before the war but the news bulletins were produced by Czechoslovak Radio itself. After the communist takeover in 1948, Czechoslovak Radio was nationalised. For the next forty years the media in Czechoslovakia were to serve "the people and the Communist Party". In 1948 the international MEVRO radio exhibition took place in Prague where the first Czechoslovak television set was displayed. The 1950s reflect the escalating war of ideologies and also technical progress. 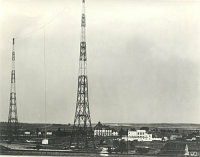 Czechoslovak Radio broadcast on two nationwide stations - Prague and Bratislava, new transmitters were built, new regional stations opened. In 1952 Czechoslovak Radio started jamming the broadcasts of Radio Free Europe. An authority called the Main Board of Press Supervision was established to play the role of a censor. In 1953 Czech Television started its broadcasts. Until 1957 television broadcasting was part of Czechoslovak Radio. At the beginning of the 1960s Czechoslovak Radio started FM broadcasting in the 60-80 MHz band. In the 1960s the political climate became more liberal, a situation in which Czechoslovak media could thrive. This liberal period was forcibly ended by the invasion of the Warsaw Pact armies on the 21st of August 1968. There was another battle of Czechoslovak Radio similar to the one at the end of the Second World War. Fifteen Prague citizens and radio employees lost their lives in a battle with Soviet armed forces who eventually seized the building, but radio broadcasting continued from other locations. Regular broadcasting from the Czechoslovak Radio building resumed on September 9, 1968. In the following period, also known as the "normalisation", hundreds of employees were forced to leave the radio because of their political views. In 1970 a nationwide station called "Hvezda" or "Star" was established bringing news 24 hours a day. 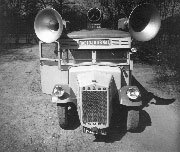 The same year saw a continuing proliferation of stereo technology in FM broadcasts. In 1972 a nationwide station "Vltava" was launched focusing on classical music and radio drama. At the same time a five-hour music and news programme in five languages called "Interprogramme Radio Prague" was introduced. It was intended for foreigners living in Czechoslovakia and neighbouring countries. The 1970s saw a boom of short-wave broadcasts by Radio Prague. Programmes in ten languages were broadcast 37 hours a day. This continued until the end of the communist regime in 1989. Shortly before that - in 1988 - the authorities inspired by the reforms in the Soviet Union stopped jamming western radio stations. After the 1989 Velvet Revolution Czechoslovak Radio broadcasts were freed of ideology and turned back to the objectives of radio: to bring unbiased information, to educate and entertain. Radio Prague reintroduced its original signature tune from Antonin Dvorak's New World Symphony, which was used from 1936. In 1990 Czechoslovak Radio became a member of the European Broadcasting Union. In 1991 Czechoslovak Radio became a public-service institution, independent of the state and funded by licence fees. The General Director is appointed by the Radio Supervisory Board, elected by parliament. The law also opened the market for commercial radio stations. With the split of Czechoslovakia on January 1, 1993, Czech Radio came into being. It ran a network of regional studios and three nationwide stations including a news and music station "Radiozurnal", "Praha" focusing on education and entertainment and finally "Vltava", devoted to literature and classical music. In 1995 a new nationwide channel was established, called Czech Radio 6/Radio Free Europe, combining news, political analyses and comments, submitted by RFE/RL, BBC, Deutsche Welle and the Voice of America. However, the partner stations gradually withdrew from the project and currently the whole programme is produced by Czech Radio. In 2000 Czech Radio started using a new "studio building" equipped with cutting-edge digital technology.